SOMMspirations: WSET Diploma: Unit 3 Tasting Exam……take 2! Last week I took the WSET Diploma Unit 3 tasting exam for the second time. If you recall I took both the tasting and the theory exams in June (read more HERE). I felt pretty good about the tasting (after all, that’s the easier portion of the exam and has a higher pass rate) and was nervous about the theory. Fast forward to September when I got my results. I had PASSED the theory exam and FAILED the tasting exam. Exactly the opposite result I had expected. I was in shock for a couple of days, but it was a blessing in disguise, because to have to retake that theory exam is a BEAR. It’s extremely difficult (and time-consuming) as there is so much information to cover. I shudder at the thought of covering my walls in 40+ flip chart sheets: France in my living room, the rest of Europe in my dining room, Australia and New Zealand in my hallway and the US, South America, and South America in my bedroom. This tasting exam was different than the one in June, because I did not have a cohort to study with. In preparation for the exam in June, I met weekly for tasting groups with other Diploma students. We also had 6+ months to taste our way through the world of wine. In hindsight, I think the problem was that I was too focused on the theory exam. That was the tough part of the exam and what I focused my time on. I was a bit cocky with the tasting exam and just assumed I’d pass. Well……that didn’t happen! For this exam last week, I signed up at the beginning of October, which gave me 8 weeks before the exam. And out of those 8 weeks I was on the road traveling (some personal and some business) for close to 4 weeks. It’s a bit crazy that I even attempted the January test date, but the alternative was to wait until June, and I was just ready to get it over with. Because I didn’t have a full group to study with, I made do! A couple Diploma students so graciously agreed to taste with me and help me with test prep. Other students gave me wines to taste through and study with. I went to wine tastings around town to get some exposure to classical regions (i.e. Bordeaux and Burgundy). A couple days before the exam, I was able to meet up with a gal who was also taking the exam (we had never met), but we spent a marathon evening together tasting through 18 wines! It proved to be a good move, as some of those wines were on the exam! This time I went into the exam much more relaxed than in June. 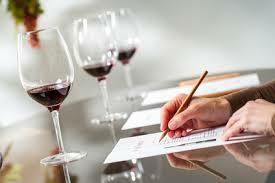 In June we had the tasting exam in the morning and theory in the afternoon. There was a lot of pressure and worry throughout the day for the theory portion, which didn’t allow you to focus on the tasting. Also, I was not 100% comfortable with the exam layout and details. In June, I lost a good 2 minutes (which is a lot of time!) trying to figure out which flight category I had in front of me, and not being sure which wine to taste first. All this was due to my text anxiety. When I went in this time, I slept well (no late night theory cramming) and I was quite relaxed at the exam site. I was prepared and knew exactly what to expect. This flight ended up being all Riesling. Upon smelling all 3 wines, that was my guess. I got a strong petrol note on #2, which ended up being my marker and what lead me to record Riesling as the grape. I also called all 3 countries correctly. Wine #1 was Alsace, France (which I called). Wine #2 was Clare Valley, Australia (I called Australia though I can’t recall if I called Clare or Eden Valley). Wine #3 was Mosel, Germany (I called Rheingau, Germany). This was a white wine and two reds. Upon smelling the wines, I was not as decisive as I was on the previous flight. I felt we were in a relatively warm climate, as the two reds had quite ripe fruit on them. Upon tasting, the white wine was relatively unremarkable. It was clearly not an aromatic variety and clearly not Chardonnay, which eliminates quite a few things. Once I tasted #2 things got interesting. This was a sweet wine. A sweet red. Not many options there. Wine #3 was a higher alcohol red with ripe (almost raisined) fruit. Then it hit me. Veneto. I think we are in Veneto and these are all Valpolicalla wines. The options could be Soave for the white, Recioto for the sweet red, and Ripasso or Amarone for the last red. I ran with that and luckily called the region correct! For wine #2 they even asked us for the grape(s) and luckily I knew where we were, so I was able to list: Corvina, Rodinella, and Molinara. In June, our quality assessment flight was 3 Chardonnays from Napa/Sonoma. These are pretty easy wines to peg. It was obvious we were drinking New World Chardonnay. This was one of the flights I passed on that exam. In January here, we had a flight of reds. I stuck my nose in the glasses and did not have an immediate sense of what we were drinking. I didn’t panic, decided to go through the tasting notes, and then make a decision. As I tasted through, I started eliminating things it couldn’t be, such as Cabernet Sauvignon (no black fruit), Zinfandel (not ripe enough), Pinot Noir/Gamay/Nebbiolo (too deep in color for any of these). In the end, I began to think these were either all Merlots or all Malbecs, as both have predominantly red fruit. Mind you, you do not have to call the grape or region with this flight. You just have to assess the quality. However, it doesn’t hurt, and in fact, is a good idea to have an idea what’s in your glass, so that your notes on structural elements (i.e. acid, tannins, body, alcohol, etc) are in line with the grape. I decided this was a flight of Malbecs. There was just too damn much plum on these wines to be anything else, and the color of these wines had purple to it, which is also a marker for Malbec. I was less clear on the quality levels of each wine, as most Malbecs I’ve had would fit squarely in the “good” category (those $8-$12 bottles at the grocery store or big box wine retailers). We’ll see how this flight shakes out! This is generally the most difficult flight as the wines have nothing in common with each other. I had a tough time with the first wine. I did not have a sense of what it was, even after my tasting notes were completed. I went through my mental grid of grapes and came up with Semillon based on what I had written. Hunter Valley, Australia was my natural guess for region and country. This ended up being a White Burgundy (Chassagne Montrachet) 1er Cru. Whoops! Couldn’t have been more off. Nothing else to say here! Wine #2 was an oaked red, presumably with some age. It felt Old World to me and had the nose of either Italy or Spain. There’s a certain earthiness/rusticity I get in wines from both of those countries. I called this a Rioja, as there were call kinds of tertiary notes common in Rioja: tobacco, cedar, cigar box, etc. The wine ended up being a Rioja Reserva. Yeah! Wine #3 was obvious from the first smell. It had that pronounced “Marlborough Lift” that Erica Crawford had recently explained to me (see post HERE). Lots of green notes (grass, gooseberry, pear, etc). And once I put this wine in my mouth, it was all confirmed. This was a Marlborough Sauvignon Blanc. And by golly gosh, that’s exactly what it was! There you have it. I am quite proud of how I showed on this exam (whether I pass or not!). I called (in some way or another), 11 of the 12 wines. When I think back to my tasting skills when I started the Diploma in June of 2015, I realize I have come a LONG way. I had no idea my blind tasting skills would develop this much! With that being said, I’m going to bask in this post-exam glow, and hope like heck I passed! If so, my hubby and I will be on our way to London in January 2019 for the Diploma Graduation ceremonies! Until then, you’ll hear from me a lot more. I plan on blogging once a week, and I already have a pretty decent lineup of wine events/trips planned for the Spring. For those currently studying with the WSET program, hang in there! Yes, it is a doozy, but the program is an incredible way to end up with a very good handle on the classic wine regions of the world, and not to mention decent knowledge of fortified wines, sparkling wines, spirits, and consumption/production patterns and trends around the world. Have you taken any WSET classes? Would you recommend them to others? Comment below!